PARC Bushings is a division of Power Asset Recovery Corporation, one of the largest companies in the world for used / rebuilt power transformers and power transformer parts, bushings up to 500kV, pumps, LTC switches, fans, and gauges. Founded in 1998 by Rick Kopf, Power Asset Recovery Corporation has expanded our inventoried stock of bushings to bring you the largest inventory of the most bushings brands available, ready to be shipped to you immediately. Jon Kopf is our bushings expert. He’s been a valued member of the Power Asset team for 12 years, and is well known in the industry for his knowledge of bushings and willingness to go the extra mile to get you back up and running. While large enough to handle any power transformer project from start to finish, no matter the size, location, or complexity of project, we are small enough to be attentive to your needs. So, whatever your needs, contact Jon. 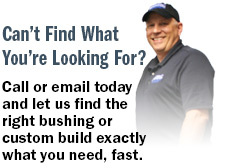 We're ready to help with your transformer bushings needs. PEPCO tested and subsequently found that several of their bushings in a large autotransformer had unsatisfactory power factors. SIEMENS field service called PARC and found all (8) unused bushings in stock.